A couple of years ago as I spent some time in Fayetteville, I regularly visited local stores selling used books. I learned that the best (i.e.,read-worthy or resalable) used books could be bought at the Fayetteville library store. Also, I noted the Goodwill thrift store on College Avenue often put out some desirable books, but other Goodwill stores around Fayetteville seldom had books I wanted (perhaps they had all been taken before I got there). The worst thrift stores for used books were the area Salvation Army stores. At one time, these stores had filled many shelves with books, but apparently they had decided to quit doing so. I mention the various thrift stores selling used books, and my low regard for the book stock of the Salvation Army stores, to make this point: never give up on stores selling used books. This lesson was made clear one day when I was checking local thrift stores for books, but finding few of interest. Discouraged, I had decided to skip the Fayetteville Salvation Army store, but at the last minute pulled into its parking lot and dashed in for a quick look. There, tucked away on a bottom shelf, below several shelves full of worthless hard-back novels, I found the best book I have ever bought at a thrift store. The book’s title was not very enticing: Credit Guide: “The Red Book” (second edition). And the large format book (8” by 11”, three inches thick) was in poor shape: its pages had pulled away from the binding and its cover was dirty. Despite its shortcomings, the book was an exciting find because it is rare (it may be the only copy in existence) and it contains otherwise unavailable information of genealogical interest. This book, published in 1910 by the Inter-State Credit Men’s Association in Kansas City, contains the credit ratings of people living in Benton, Washington, Madison, Franklin, Crawford, and Pope Counties of Arkansas, plus a few other scattered locations. Altogether, the 900-page book has about 54,000 listings,each with a person’s name and credit rating(s), and most have information about the person’s occupation and where he or she lived. Until 1920, when the NACM created a national credit clearinghouse, credit information was assembled mainly local associations for local markets. A local Credit Men’s Association collected feedback about the payment records of people to whom its members (merchants and other businessmen) had extended credit. This feedback was assembled and published in books such as the one I found. In placing this work in the hands of our subscribers, we wish to emphasize the fact that the ratings contained herein are purely the expressions of business men, based upon their experiences with the parties rated. We believe that this is the true plan of establishing credit. It is information gained by actual experience, as distinguished from mere opinion formed by observation. We have great confidence that its merits among businessmen will soon be universally recognized. We believe therefore, we are warranted in the assertion that our ratings are more nearly accurate than those attained from the ordinary source, and as the value of our plan gains increased recognition, our ratings will be correspondingly more correct. We, therefore, wish to emphasize the importance of mutuality in effort, between our subscribers and the Agency, to the end that each may profit by the other’s assistance. I assume that Credit Men’s Associations in other major cities and regions were using the same methods to produce similar books for their subscribers. However, such books are difficult to locate. A Google search finds few references to similar credit guides, and Google Books has no digital copies of such books. Also, early credit rating information is not available through Ancestry.com, indicating that it does not have access to early copies of credit guides. Probably the main reason why so few old credit guides have survived is that they were not general circulation books: they could not be purchased by the general public and they were not included in library collections. In fact, these books were not sold to anyone. They were instead loaned to subscribers for a specified period. This volume of “The RED BOOK’ Credit Guide is not sold but is loaned to ________ Subscriber for ______ from _______ 1910 as per specific agreement of contract, and if found in the hands of those not entitled to use it will be taken possession of by the Inter-State Credit Men’s Association and all rights under conditions of contract will be annulled. The “Strode-Long Mer Co” was a general merchandise store located in Bentonville. Its owners were Claude Henry Strode (Oct. 18, 1879 – Oct. 10, 1958) and H. B. Long, about whom I found little information. Strode left the mercantile business in the middle of the 1910s and had a long career managing vinegar plants (mostly for the Ozark Cider and Vinegar Co.) in several cities, both in Arkansas and other states. Likely, this book should have been either destroyed or returned to the I-SMCA after August 19, 1912, when the period of the loan expired. Fortunately, it was neither returned or destroyed, but instead was stored away for a hundred years until someone decided to get rid of it by donating it to the Salvation Army. Mr. Branham had ratings from two businesses that had extended him credit. One reported “Fair Pay” for credit given him of $5 to $10; another reported “Fair Pay” for credit of $1 to $5. Apparently “Fair Pay” was worse than “Prompt Pay,” but better than the other categories. Mr. Branshetter also had two ratings, both of them bad. Apparently, he did not pay off in an acceptable way the credit extended to him by two businesses. Mr. Branson had two rating. One rating indicated that he was slow in paying off the $1 to 5 credit extended to him by one business; another business reported that he did not acceptably pay off the credit given him. Where Your Ancestors Credit Worthy or Deadbeats? 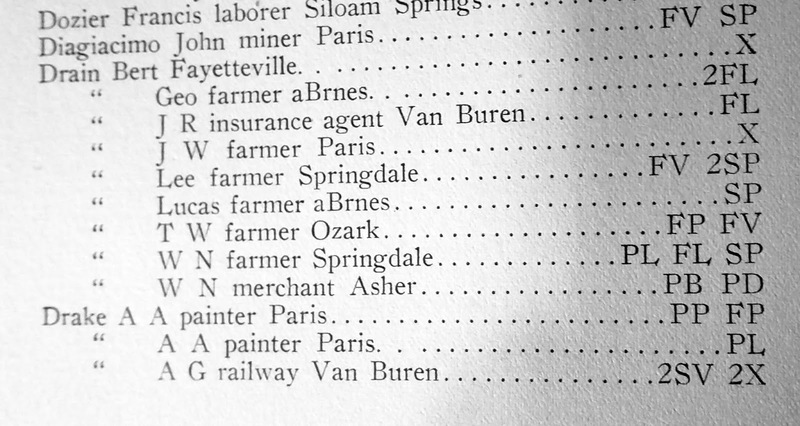 The beauty of the Credit Guide: “The Red Book” is that it provides information not available elsewhere about the credit worthiness of about 54,000 people (mostly men) living in Northwest Arkansas in 1910. If you had ancestors living in the six covered counties during this period, you might be able to learn something new about them from this book. 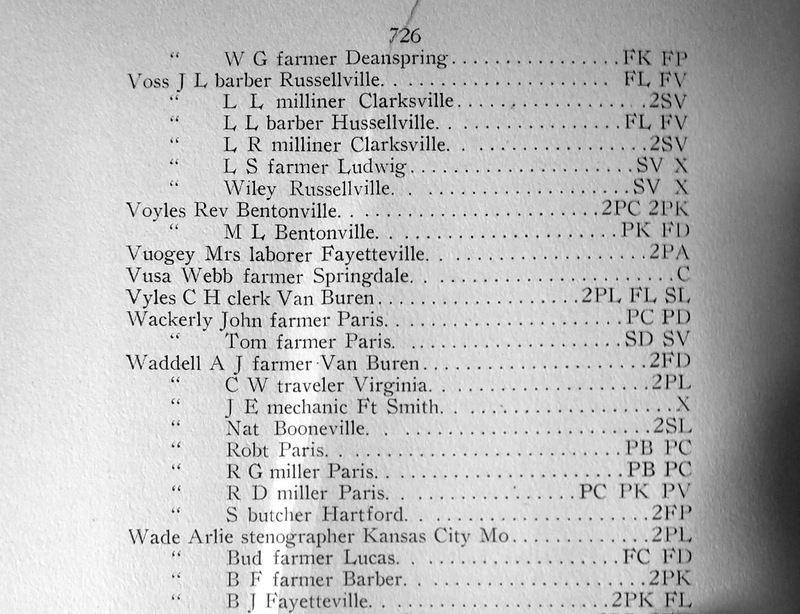 For example, in 1910, I had ancestors living in Madison County (Brannon and Couch families) and in Franklin County (Durning and Harris families). So, I can use the book to find out if they received credit and, if they did, how their use of credit was rated. Apparently, my Couch and Harris family ancestors did not use credit during the time the 1910 credit ratings were assembled. They do not show up in the book. Among 19 listings of Brannons, one is located in Health, where, in 1910, my grandmother – ten years old -- was living with her parents Robert C. and Sibbie Shackelford Brannon. Likely, Robert is included in a listing for “Brannon & Son” who were merchants living in Health. This listing had one rating: X. Brannon & Son had not adequately paid off credit one business had extended to them. While no listing can be found for a “Durning,” there are two listings for “During.” One of them is obviously a listing for John Lewis Durning (1849 – 1916) a farmer living in Cass. He had two credit ratings, SP and SV. These ratings document that he was slow repaying credit of $5 to $10 to one business and slow repaying $1 to $5 to another business. Another “During” is listed: J. Z. During, a farmer living in Ozark. He was probably a relative, but I am not sure who this person was. I have no record of a Durning with those initials. However, many Durnings moved to Ozark in the early part of the 20th Century; most were the children of George Durning (1873 – 1912), son of John Lewis Durning and Polly Welton. Whatever his relation to the clan of Cass Durnings, J. Z. “During” did not have a good credit history in 1910. He had two ratings. One, SV, indicated that he was slow in paying off credit of $1 to $5. The other rating, X, documented his failure to adequately pay off credit extended by another business. 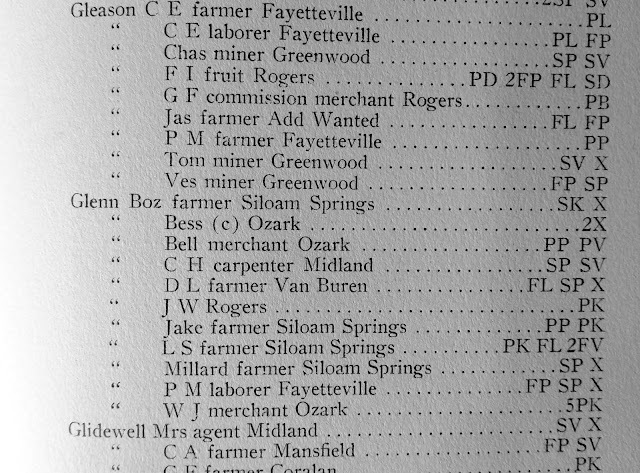 As the examples of my ancestors show, the Credit Guide can provide some interesting morsels of information about the history of families living in Northwest Arkansas. Want to Check the Credit Ratings of Your Ancestors? 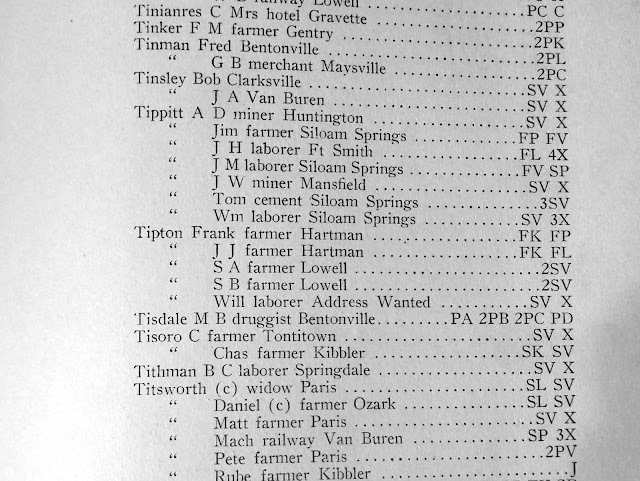 If you had ancestors living in Washington, Benton, Madison, Franklin, Crawford, Clark, or Pope Counties in 1910 and would like to know their credit ratings, use the comment section below to provide the last name(s) and their likely location and I will post the relevant information (if any is available) from the Credit Guide below. Last name: Leming, Lenning, Lemming and Lemings. For more in-depth information on the Credit Men’s Associations, see David Sellers Smith. The Elimination of the Unworthy: Credit Men and Small Retailers in Progressive Era Capitalism. The Journal of the Gilded Age and Progressive Era, (9) 2. April 2010, 199-220 and Rowena Olegario. A Culture of Credit: Embedding Trust and Transparency in American Business, Harvard University Press, 2006. Lemming (or Lemmings, Lemming, Lemning) possibly in Pope County. Thank you!! I have posted the Lemming, Leming, Lemming, and Lemings that were listed. It seems several were in Sebastian Co. but none from Pope County show up. Dan! " morsels of family history indeed! I can imagine your thrill at this historical record find. 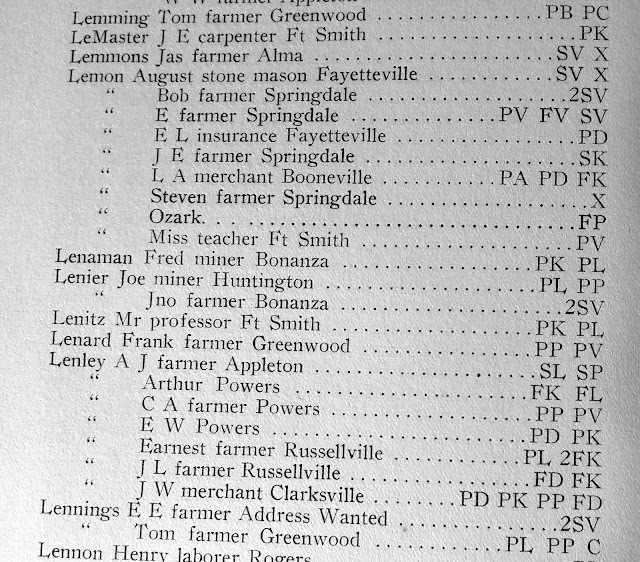 According to a Drake family tree listing created by my Uncle Jack Drake( now 80, living with his wife in Lowell AR) my great grandfather , Jacob Franklin Drake could be the farmer listed in the Red Book. His son, Bill married my grandmother, Carrie Glenn in Madison CO. Are there any listings for Adam Glenn? He would have been listed as a merchant, I guess. He made wooden pallets which he would take by wagon into Fayetteville. Cynthia - A "CR Glenn" shows up (see the Glenn listings that have been appended to the blog), living in Midland, Sebastian County (oops I omitted that county from the list of locations covered). His occupation is carpenter, so maybe that is him. A slow payer. Oops, I got confused. As I understand it, Bill Drake married Carrie Glenn, whose father was Adam Glenn, who lived in Madison County and made wooden pallets. Sorry, Adam Glenn does not show up in the list of Glenns (and obviously C R Glenn is unrelated to those you mention). Your grandmother was probably famous in Fayetteville, with so many people eating at the Redbird Cafe over the years.